Russia’s Transport Clearing House has published the 2017 performance results for the country’s airline industry, complete with the top-20 list of Russian carriers by passenger traffic. The report, which was made available to Russian Aviation Insider, indicates that all of the leading 20 airlines demonstrated operational growth last year. 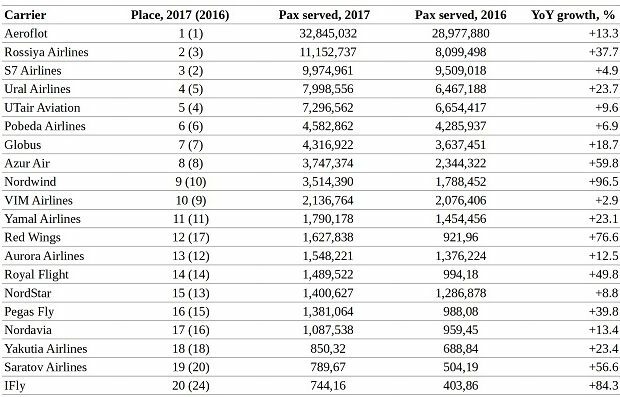 Even though the top five of the carriers remained largely unchanged from 2016, some of the airlines moved up or down the list. Unsurprisingly, Russia’s national carrier Aeroflot led the industry with 32.845 million passengers served, or 13.3% up year-on-year. The airline continued with its fleet expansion drive, adding new Airbus A320s, Boeing 737-800s, and Sukhoi Superjet 100s (SJ100). Rossiya Airlines, another subsidiary of Aeroflot Group, came second in the ranking with 11.153 million passengers. The operator moved up one rung from 2016 with a growth rate of 37.3%, the highest among the top five carriers. In the preceding year, Rossiya had merged with OrenAir and Donavia and also partially inherited the fleet of now-defunct Transaero Airlines, which is believed to have contributed to its rapid growth. The third largest carrier, S7 Airlines, demonstrated the slowest growth rate of the top five so ceded its 2016 position to Rossiya. The airline carried 9.975 million passengers last year (+4.9%). Its sister carrier grew faster at 18.7%. The operators’ parent company S7 Group explains this disparity by its current strategy of operations and fleet management. S7 Airlines last year began operating two new aircraft types: the Embraer E170LR and the Airbus A320neo. Ural Airlines served 7.999 million passengers, up 23.7% on 2016. The carrier steadily increased its capacity and traffic throughout the year; its growth rate reached 294.9% in mid-2017. UTair Aviation’s 2017 traffic stood at 7.297 million, up 9.6% year-on-year and exceeding the 6.988-million target. The growth was due to the airline’s efforts to improve operational efficiency, including through a higher seat load factor and shorter turn-around times; the operator did not add any more capacity last year capacity. Several top-20 airlines demonstrated substantial traffic growth. Nordwind Airlines, which launched scheduled flights last year, was the highest-growing of them all at 96.5%. The carrier kept adding airliners to its fleet during 2017. Charter operator Azur Air served 59.8% more travelers than it had in 2016, and expanded its fleet with Boeing 737-800s. 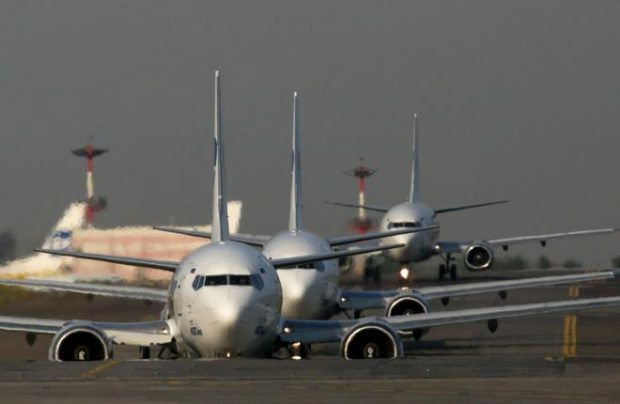 Red Wings saw its traffic increase 76.6% as a result of fleet expansion with Airbus airliners, which is a deviation from its original strategy of operating exclusively Russian-made aircraft. Saratov Airlines carried 56.6% more passengers, due in part to the use of Antonov An-148 regional airplanes subleased from Rossiya. IFly, another charter carrier, qualified for the Top 20 for the first time since founded, climbing from 24th position with a growth rate of 84.3%. Two more charter operators, Pegas Fly and Royal Flight, saw their traffic grow 39.8% and 49.8% respectively. The Top 20’th combined traffic reached 100.275 million passengers, out of the total of 105.023 million who traveled by air into, out of, and within Russia last year (up 20.2% and 18.6% year-on-year, respectively). Their share in the total traffic thus increased from 92.2% in 2016 to 95.5%. Vladimir Tasun, president of the Russian Association of Air Transport Operators (abbreviated to AEVT in Russian), commented for Russian Aviation Insider that the main driver behind the 2017 traffic growth was the domestic carriers’ modest pricing policy amid the growing airport fees and fuel costs. Other growth factors included the strengthening of the national currency and the resumption of direct air services with Turkey, which had been suspended until August 2016. AEVT believes the industry closed 2017 with a moderate combined profit, partially because the VAT rate on domestic flights had been reduced by 10%. The association does not expect the high growth rates to continue into 2018, saying the average growth is to be expected at not more than 10%. According to Tasun, Russia’s commercial aviation has used up all of its extensive growth reserves by now: the main growth driver will now be represented by domestic operations, but these need time to evolve.